Apply Now! The 2018 Early Career Scholar Forum Radical Dreaming for Radical Change will be held on April 13 from 9:00 am – 2:00 pm. This year's forum will focus on several critical issues facing critical scholars including teaching and working around white resistance, navigating social media as a public intellectual, publishing, and self-care just to name a few. Participants will have a chance to receive advice and perspectives from advanced critical scholars such as Dr. Tracy Buenavista, Dr. Brian Jones, Dr. Veronica Valez, Dr. Teddy Chao, and many more. The application deadline has been extended to midnight PST Monday, March 5th. This amazing professional opportunity is free of charge, so space is limited. Please share this event with any interested parties in your network. The committee is excited to present an event that will be personally and professionally beneficial! If you have any questions, please contact cesjearlycareerscholarsforum@gmail.com. Please see the flyer below about this year's FIRST EVER SIG Joint Reception (or MEGA META RECEPTION). The 2017 CESJ Graduate Student Forum "Hope and Resistance: Strategies for Social Justice Scholarship and Praxis"
​The session includes a light breakfast, full lunch, and a panel of distinguished professors with opportunities to interact informally with panelists and other participants. The GSF will take place Thursday April 27, 2017 8a-1p. For more information about registration and deadlines, please see our news posting here. 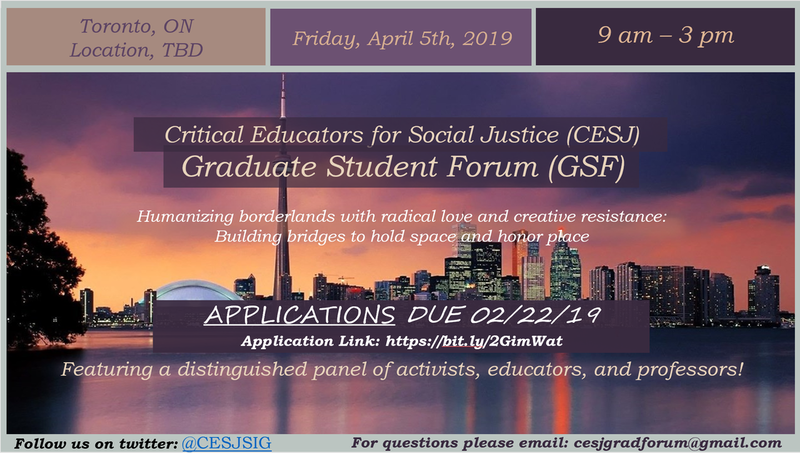 The Critical Educators for Social Justice SIG will offer a pre-conference Early Career Scholar Forum: Navigating and Surviving the Academy as a Social Justice Scholar on Thursday, April 27, 2016, 3:00 p.m.-6:00 p.m. Location: TBA at the upcoming 2017 AERA Annual Meeting in San Antonio, TX. This pre-conference forum is for early career scholars (non-tenured). The forum is open to early-career tenure track faculty, non-tenure track faculty, and postdoctoral scholars. During the forum, participants will gather with scholar-mentors from CESJ to discuss various topics related to research and scholarship, teaching, community-engaged scholarship, and service. The purpose of the forum is to provide early career scholars with 1) a sense of community with scholars committed to critical scholarship and social justice; 2) mentorship from a range of scholars (junior and senior level colleagues); 3) practical tools and strategies for navigating academic contexts; 4) a chance to network and build community with other CESJ early career scholars. This is the SIG’s second year offering this event. For more information about registration and deadlines, please see our news posting here. Calling all social justice artists, musicians, and poets! This year, we are trying something a bit different for our CESJ social by hosting an Open Mic Night on Sunday, April 10, 9-11. We invite you to consider lending your musical, poetic, and other artistic gifts to our theme: "Same Song, Different Verse: Art & Activism in Social Justice Education". Activist art can help us make sense of the past, present, and future of the enduring struggles, recurring questions, and ubiquitous themes in social justice education—and taps into an important part of us that doesn't get much air time at AERA. What makes you despair? What gives you hope? How can the arts help sustain our education justice work? Please sign up to perform here: http://goo.gl/forms/InJB3ToAQn Do it now. We know you want to. Everyone is welcome to the event. There's plenty of space, so no need to RSVP to attend. There will be FREE FOOD, of course, including options for vegans and gluten-free folks. We’re hosting it at the African American Civil War Museum, just one mile north of the convention center. It's also easily accessible from the metro. Just take the green/yellow line north to the U Street stop (two stops north of the Convention Center) and exit on the 11th street side. You'll take the escalator or elevator to a small plaza and the museum is just to your left (the east) across the street. Doors open at 8:30 after our Business Meeting. the Business Meeting & Social, the Graduate Student Forum, and our new Early Career Scholar Forum. We are seeking members to organize and facilitate the Business Meeting & Social. The purpose of this event is to have senior and junior faculty network and engage in dialogue about topics including tenure and promotion, and social activism in academia... and then to build community with a purely social event. The purpose of this event is to connect social justice oriented professors to graduate students for professional development about scholarship, grants, jobs, tenure, activism, and other relevant topics. We are seeking members to help organize the Community Event. The purpose of the community event to learn, share and/or engage in community activism in the local area surrounding AERA.